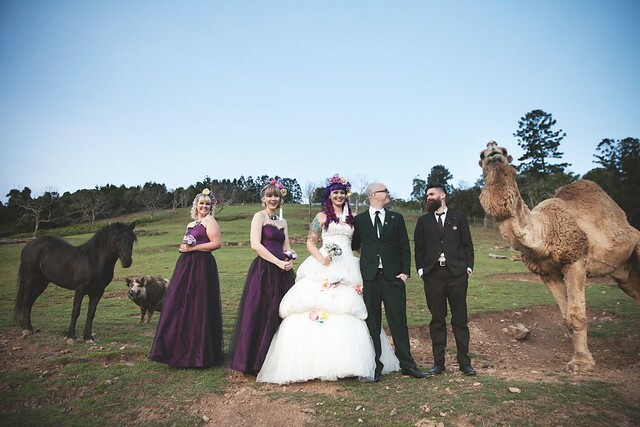 Welcome to my final wedding post! To read the other five posts, please go here. 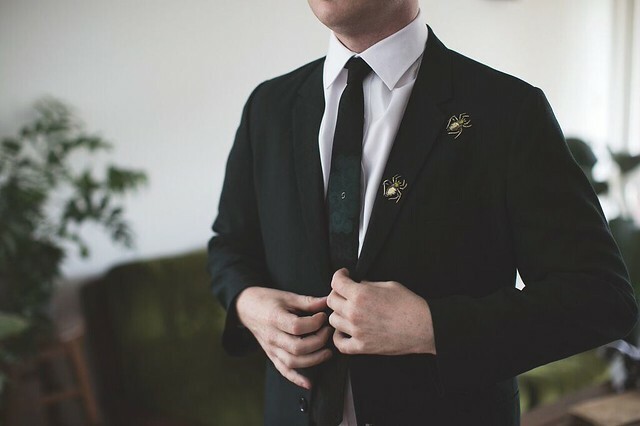 Now you know about how the biggest day of my life went, I thought I’d wrap things up by sharing the details of what we all wore. 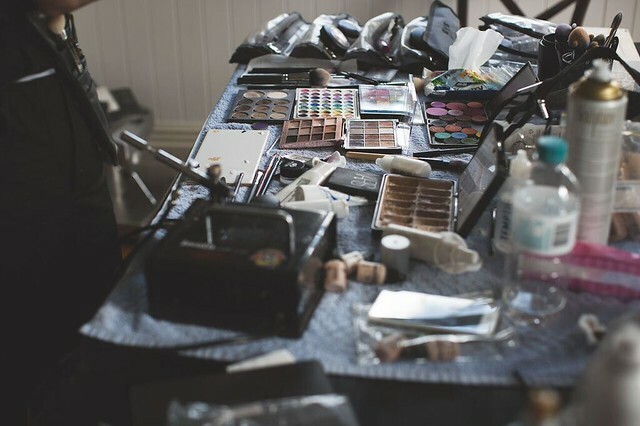 I’ll provide links wherever possible in case you need recommendations for your wedding! First of all: MY DRESS! Mum and I briefly entertained the idea of making my dress because we didn’t believe there was any chance of finding the right dress on a rack anywhere (without paying dearly for it, anyway). But then we looked into buying fabric and almost fainted at the projected cost and decided to see what was out there that we could customise. I’d initially wanted a grey or light purple dress to go with the theme, and I was obsessed with this dress by Japanese designer Stella de Libero which I was hoping to replicate in some way, but we had no idea how to do it exactly. 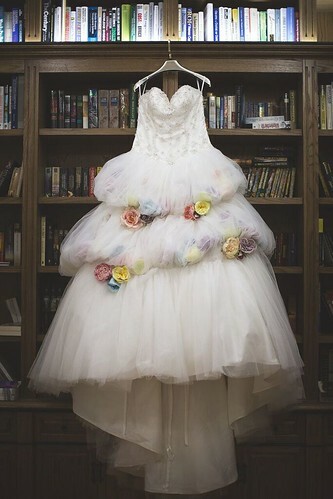 But then we stopped in at a dress shop near my home and found the most perfect dress ever! I had no intention whatsoever to wear white, it just seemed so unlike me, so it was pretty surprising when I saw this dress and immediately though “yes, this is it”. It’s actually a Disney dress, specifically Belle from Beauty and the Beast so it also came in a pale gold colour (like from the movie) but white was where it was at. I put it on and it fit like a dream and mum could immediately see how she could adjust it to make it look like the Stella de Libero (SdL) dress and that was that, we had the toughest part of my dress sorted! To customise it and capture the look of the SdL dress, we took the original white satin flowers off and replaced them with colourful fake roses and flowers we collected. One of the things that endeared mum and I to this dress was the fact it already had pick-up’s (that is, parts of the skirt were tacked up to create puffy sections) which we filled with more flowers which were wrapped in sparkly tulle to mute the colours and add some sparkle! We’d had plans to add some Halloweeny stuff into the skirt but we really just didn’t have time to track the right items down, though in retrospect I think the flowers were perfect on their own. The top of the dress was absolutely perfect as it was so we didn’t have to adjust it (the bodice had a flattering dropped waist that was encrusted with gems, sequins and silver thread). Mum added a white satin bow to the back of the bodice which was meant to allow the train to be tucked up for dancing, though we didn’t actually remember to do that on the night! Details: Original dress is Belle’s Disney Princess Bridal Gown in white/metallic by Alfred Angelo, bought at Hills in Hollywood in Brisbane. 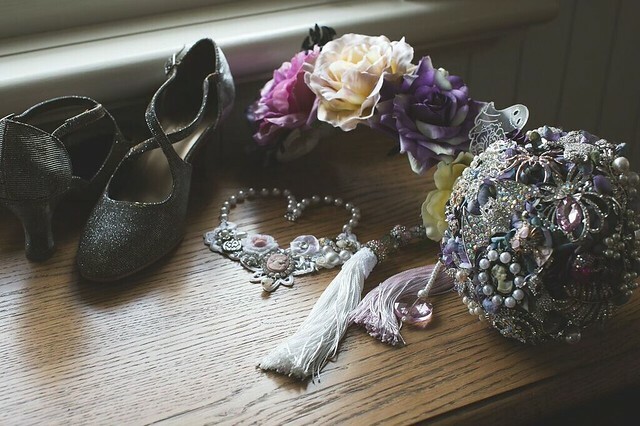 When it came to my accessories, I wanted to continue with the look in the photo of the SdL dress, so we made a flower crown using more of the flowers and roses we used in my dress which we attached to a long fascinator base. I designed the tassels using beads and fringing mum already had which were sewn onto the base before glueing the flowers on. I was determined for the headpiece to have spooky elements, so I commissioned Ella Mobbs from Creep Heart to design and make clear ghosts and black bats to have “floating” above the flowers. Just to clarify, I absolutely was not going for a “Day of the Dead” or Dia de los Muertos theme as a few people have assumed. I just loved the styling of the the dresses by Stella de Libero and with it being a Halloween wedding, I can see why people came to that conclusion, even though it was definitely not the case. Figuring out what jewellery to wear was really tough! I searched the internet relentlessly for classy, silver Halloween jewellery but nothing really existed that was going to go well with my dress (that wasn’t cheap and nasty or very expensive, anyway). 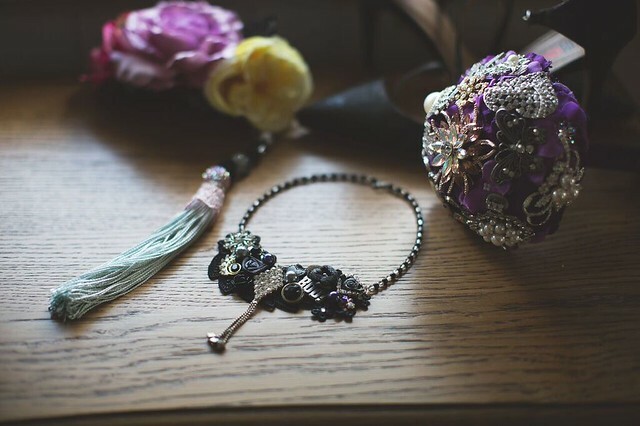 Mum eventually came up with the idea of using a piece of lace encrusted with pretty items as a statement piece. She had the lace and the bits and bobs which I pieced together like a pretty game of tetris. If you look closely there’s a pewter jack-o-lantern, a fairy riding a unicorn and a pink cameo which I’ve had for years, which made the necklace totally “me”. My good friend Danella made the pearl chain for it as we didn’t have the right pearls on hand and she’s a pro at beading! My shoes were by Easy Steps which is just about the daggiest brand of shoes I can think of BUT they’re made to be super comfy which was the only reason why I was able to wear heels for more than an hour (remember how I broke my foot in March 2014?). 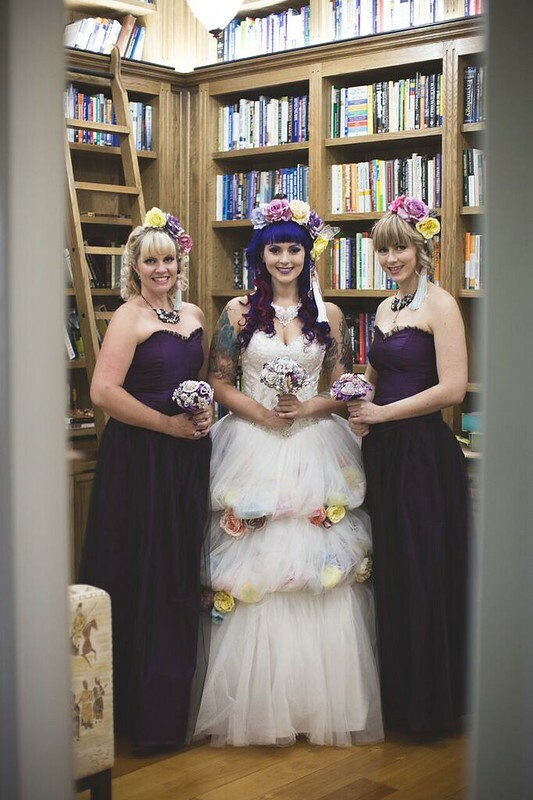 My bridesmaids dresses were one of the first things mum started making for my wedding and were also the last thing to be finished! In fact they were still being finished on the day of the wedding! 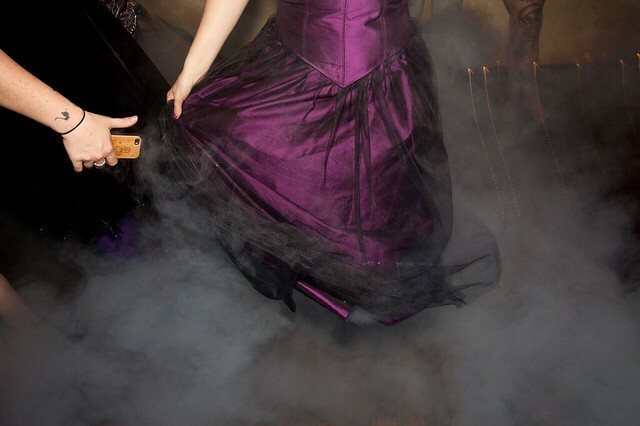 I really wanted to go with a deep purple for the dresses and I wanted to make sure the girls could wear them again later down the track, which is why we made the skirt and the bodice separate to be worn apart. Mum and I found this beautiful silk dupion which was shot with black at Fabric Collection which specialises in fine fabrics and just happens to be 5 minutes from my house. It was pretty exxy at $50 per metre but it was exactly what I envisioned. Mum made these dresses from scratch, using at last two patterns which were of almost no help to her. The skirts were pretty straightforward, the trickiest bit being the tulle overlay, but those frikken bodices! Erin and I initially tried to help mum by cutting all of the pieces out while mum gave us some sewing lessons but by the end of it mum took charge and did it all because it got too complicated. There were two potential hurdles that could have ruined these dresses but we managed to work through. The first one was when I attempted to iron the tulle on one skirt, I was holding the iron, which had a protective cover on it, a good 15cm above the tulle and yet somehow burned two holes in it! Unless mum just gave up on sleep, there was no time to replace the tulle but luckily the holes didn’t really show as the gathering kind of hid them. Phew! Then there was the fact Sarah lives a good hour out of Brisbane which means we only managed a couple of fittings and after the last one mum took her bodice in a little too far and it almost didn’t fit on the day! Fortunately we got through that by getting the girls to ditch their bras and removing the panels behind the laces. Yay! Sarah and Erin’s accessories were similar to mine but in darker hues. Erin made both of their necklaces, including all of the beading! 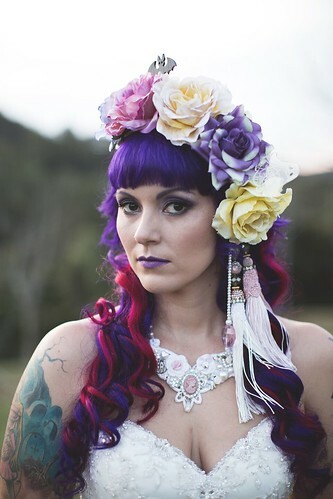 I made their headpieces as well, which were smaller and simpler versions of mine with only three big flowers each (mine had five) and one tassel versus my three. They also only had either the bat or the ghost on theirs, each a bit smaller than mine (what can I say, I’m an attention hog). The girls wore black shoes of their choices because they weren’t really going to be seen anyway, and I wanted them to be comfortable. Especially Sarah who badly hurt her foot a month or so earlier and technically should have been wearing a moon boot! God we’re all so clumsy! Ahh the bouquets! How bloody great do these look? Mum made these all by herself using a combination of brooches we already owned and others we bought especially. She created the base using fake hydrangea bunches with the brooches being attached to long pieces of wire which she thread through to form the handle which she then covered in fabric (white satin for me, leftover silk dupion from the bridesmaid dresses for the girls). 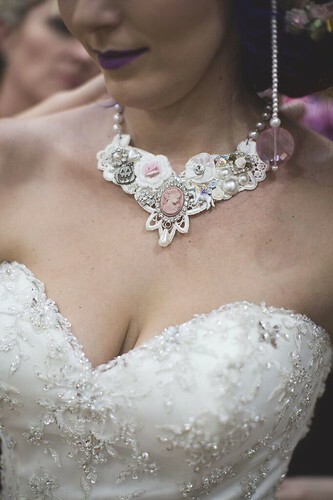 As a result they were pretty darn heavy, mine in particular as it was the biggest and had way more brooches attached, but they were so unique and exquisite that it didn’t matter. 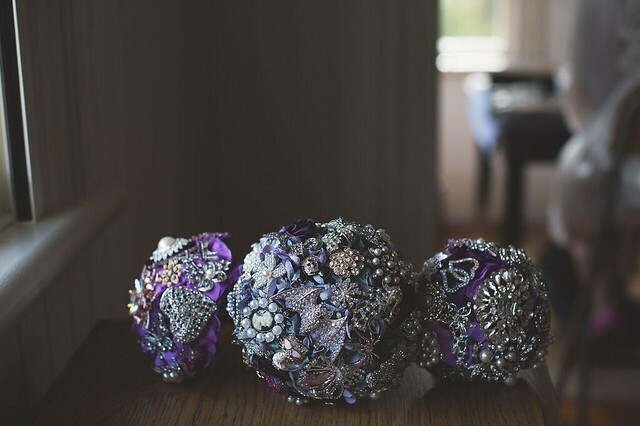 Each bouquet had brooches that suited us personally, for example some of the ones on mine were of Mickey Mouse, Hello Kitty, a poodle, the Eiffel Tower, a skull, a spider, a cameo (I love cameos) and right in the middle was a glorious, glittering bat! Oh and a C and B for mine and Ben’s names, of course! 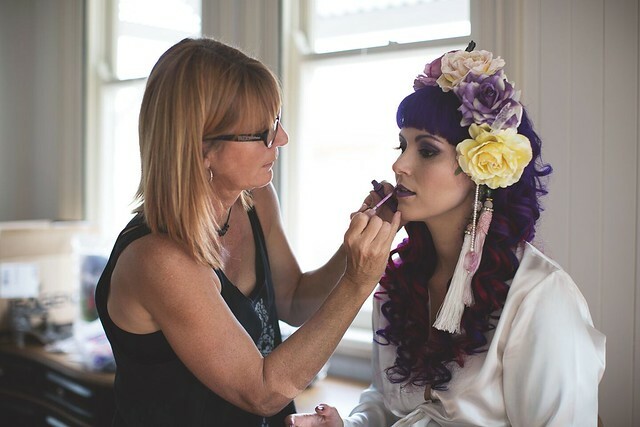 As mentioned in the first wedding post, our hair and makeup were done by Sue McLaurin. I was determined to have long hair for my wedding, but I had no interest in growing it out. I briefly considered getting proper extensions put in but was put off by the expense and the fact I knew I’d never be bothered with the maintenance. I ended up getting 16″ clip in extensions in platinum blonde from Zala, after a friends recommendation which I dyed with Brite Organix hair dye in purple and pink. 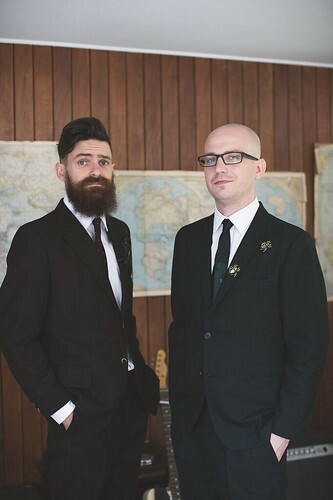 Ben and Kieran were styled by Billie, our celebrant, as she is a vintage style queen! Their suits and ties were vintage 60s suits from Retro Metro in Paddington (just two shops down from where I now work!) 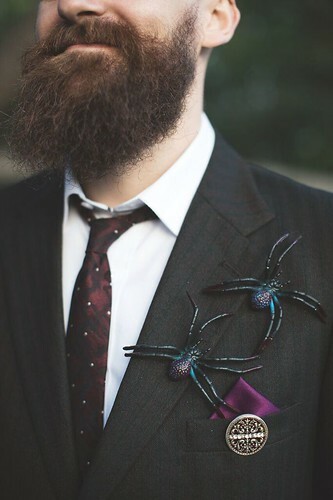 with spider brooches for some subtle creepiness. 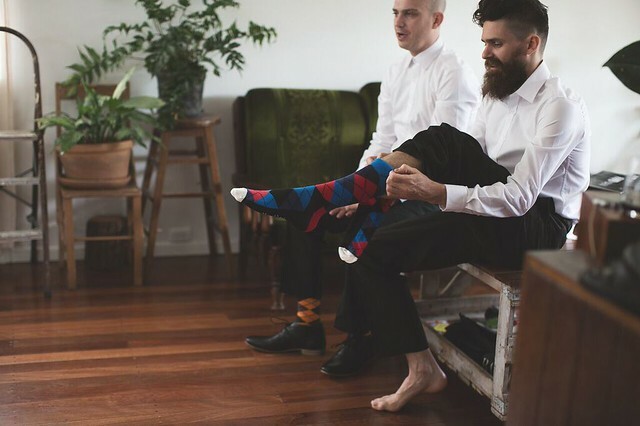 They wore bright socks from The Happy Cabin and their shoes were from Zu. And finally, our wedding rings. It took me ages to find the right ring, I fell in love with a beautiful ring I found in a shop in the City but it was almost $3000 and I felt guilty about spending so much on one piece of jewellery. But then I discovered Julie deVille and her gorgeous jewellery, particularly her range of skull rings. I always used to say that if I ever got married I’d want a diamond-encrusted skull ring, and as it turns out there was an Australian designer doing just that! I ended up going with this one, which was pretty subtle for me but it was within our price range and the thought of a tiny skull with diamond eyes really appealed to me. We got it through e.g.etal. Ben’s ring was a family heirloom, it was originally his great grandfathers wedding ring which is engraved with his initials CN. 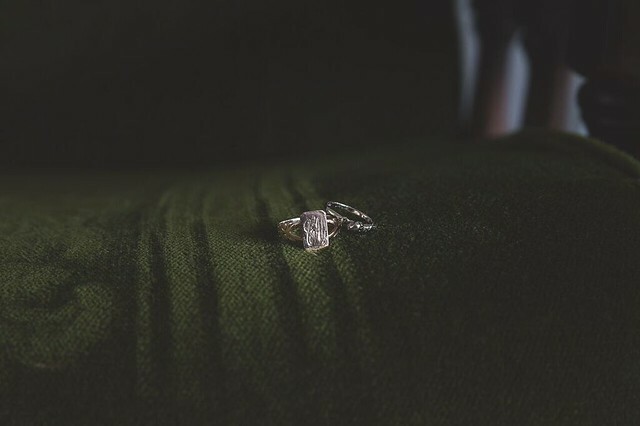 Ben is not a jewellery wearer so we had no idea what to do about his ring so when his parents offered him this ring, we were stoked! Luckily it also happened to fit him perfectly, so it was clearly meant to be! First and foremost, my mum for all of her amazing, hard work to help bring my vision to life. 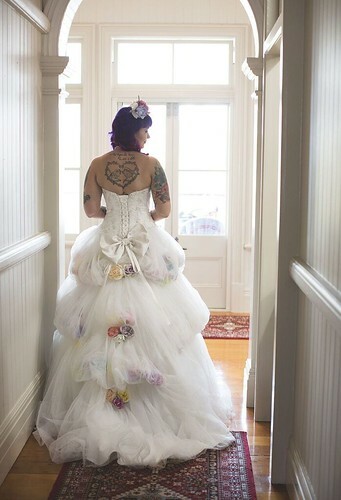 Our wedding wouldn’t have been half as great without her tireless efforts! What I Wore – Pink bat Attack!